They said they wouldn't go to the White House for a "show meeting." Democratic leaders Sen. Chuck Schumer and Rep. Nancy Pelosi pulled out of a meeting with President Trump at the White House this afternoon after he tweeted that he doesn't "see a deal" will be reached with Democrats on government funding — raising the specter of a possible government shutdown in December. Earlier in the day, Trump expressed pessimism on Twitter about the prospects for a deal. 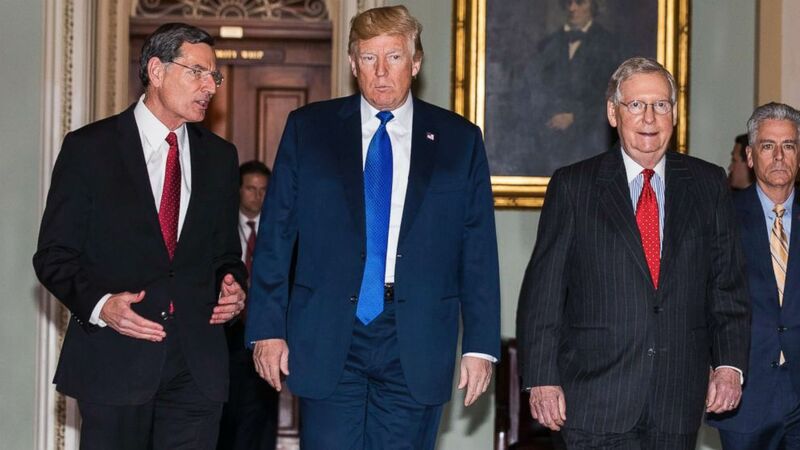 (Jim Lo Scalzo/EPA) President Donald Trump along with Republican Senator from Wyoming John Barrasso (L) and Republican Senate Majority Leader from Kentucky Mitch McConnell (R), walk to a Republican Senate luncheon where the president is expected to push Senators on tax reform in the U.S. Capitol on Nov. 28 2017. He referred to what is expected to be major sticking point on any government spending deal: The future of DACA, or the Deferred Action for Childhood Arrivals program. Some Democrats have sought to tie a solution for the more than 800,000 so-called Dreamers to a deal to keep the government open. 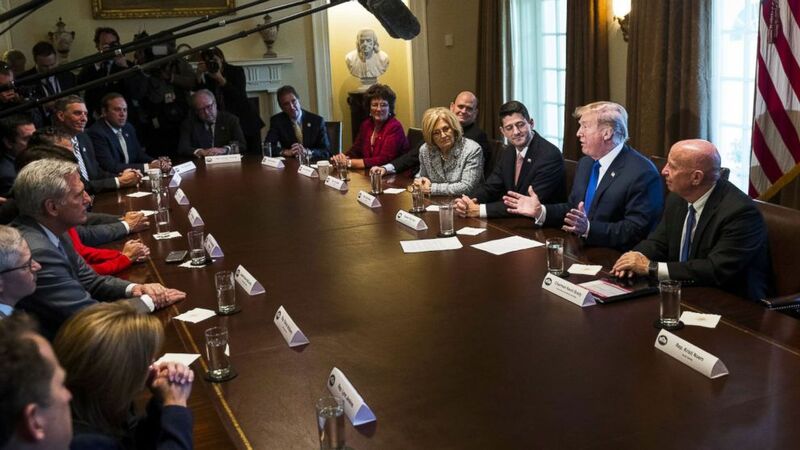 (Drew Angerer/Getty Images) President Donald Trump speaks about tax reform legislation, flanked by Speaker of the House Paul Ryan and House Ways and Means Committee chairman Rep. Kevin Brady, during a meeting with members of the House Ways and Means Committee in the Cabinet Room at the White House, Nov. 2, 2017. The White House issued a statement after Schumer and Pelosi pulled out of the meeting. Ryan and McConnell released a statement confirming that they would still meet with the president. “We have important work to do, and Democratic leaders have continually found new excuses not to meet with the administration to discuss these issues. Democrats are putting government operations, particularly resources for our men and women on the battlefield, at great risk by pulling these antics. There is a meeting at the White House this afternoon, and if Democrats want to reach an agreement, they will be there,” McConnell and Ryan said. Trump is still scheduled to head to Capitol Hill today to rally Senate Republicans on his tax plan, before a likely vote to decide the fate of the measure in the Senate this week. He has said he wants to sign a tax bill by Christmas and continued to express optimism that it will get done, even though the Senate version may not have enough votes to pass. This month Trump sat down with GOP members of the House before a tax bill was approved. But the outcome of the Senate’s tax plan is less certain. (Nicholas Kamm/AFP via Getty Images) President Donald Trump speaks to the press on Aug. 10, 2017, at his Bedminster National Golf Club in N.J. before a security briefing. With a slim two-vote majority, Senate Republicans can afford no more than two defections without sinking the tax legislation. And if the bill passes the Senate, it will still be by no means a done deal. 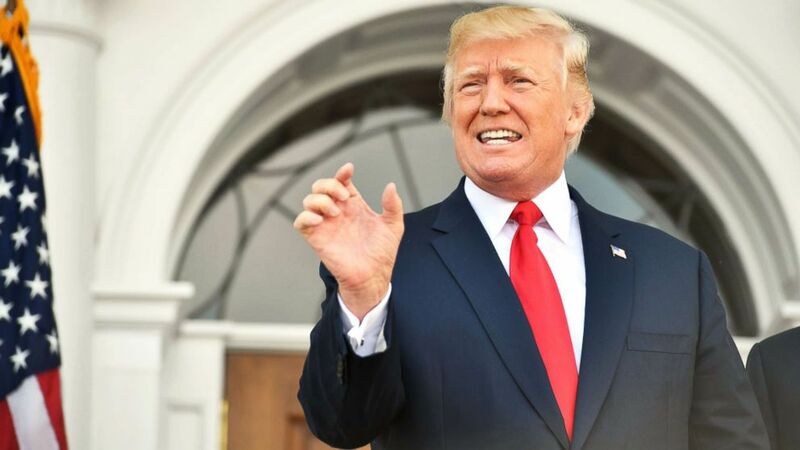 The Senate version would then have to be reconciled with the House version through a conference committee before final legislation could head to Trump to be signed. He has repeatedly said he wants a tax bill on his desk before Christmas so he can deliver a “great, big, beautiful Christmas present” to the American people. But with the prospect of a government shutdown on top of the tax agenda and other legislative issues, Congress may need a Christmas miracle to deliver on all the pressing year-end legislative ticket items. After Republicans on the Senate Finance Committee emerged from a lunch with Trump on Monday, Sen. Orrin Hatch was asked whether he believed Congress will be able to put a bill on Trump’s desk before Christmas. “I hope so,” he replied as he walked away.